I really don’t mean this blog to be one where I post random links and worse, one where I post random NEWS links so I offer my apologies. I will try not to make this a frequent occurrence but I made allowances this time as this article here is too good to NOT share with you all. For all those international visitors..this is what an Iced Vovo looks like. The battle was set to play out in the homes and offices of Australia at morning coffee and afternoon tea time, but the war of the clones ended on Thursday without a shot being fired. 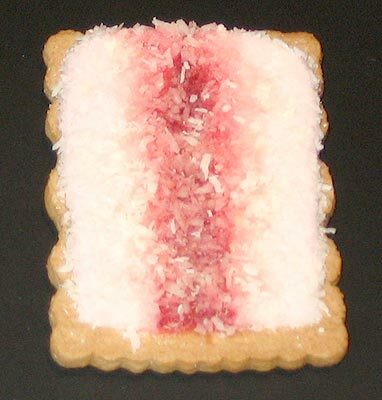 Arnott’s threatened legal action over Krispy Kreme’s Iced Dough-Vo doughnut, which is covered in pink icing and coconut flakes, just like the famous Iced Vo-Vo biscuit. An Arnott’s spokeswoman said Krispy Kreme Australia must have been coconuts to think it could take advantage of the 103-year old Vo-Vo trademark. Now the doughnut maker has backed down and agreed to rename the Iced Dough-Vo from May 11, Arnott’s and Krispy Kreme said in a joint statement issued on Thursday. I wonder why the journalist didn’t get a byline. I’m trying so hard to remain adult about all of this and not resort to porcine puns and cheesy jokes (pandemic? – and pigs may fly! hypochondriacs are hogging the tamiflu; tamiflu all the way from Mexico and boy are her arms tired, etc etc) but sometimes the jokes just write themselves. Meanwhile, a Federal Parliamentary delegation to Mexico, led by Senate President and Queenslander John Hogg, will return early because of the outbreak.